Kongsberg GeoAcoustics has recently launched its new Compact Survey Vessel (CSV) which has been specifically designed to survey shallow coastal and inland waterways quickly, using a powerful and maneuverable two-person catamaran equipped with the latest GeoSwath 4R shallow water simultaneous swath bathymetry and side scan system. The vessel is a lightweight two person catamaran and is easily transportable so that launch and recovery can be made in the remotest of locations. The craft is light enough to be launched by one person, and all the instrument controls, communication systems and survey operating tools are ergonomically designed so that everything can be accessed from the helmsman’s position. The vessel is constructed from plastic with all stainless steel fittings. 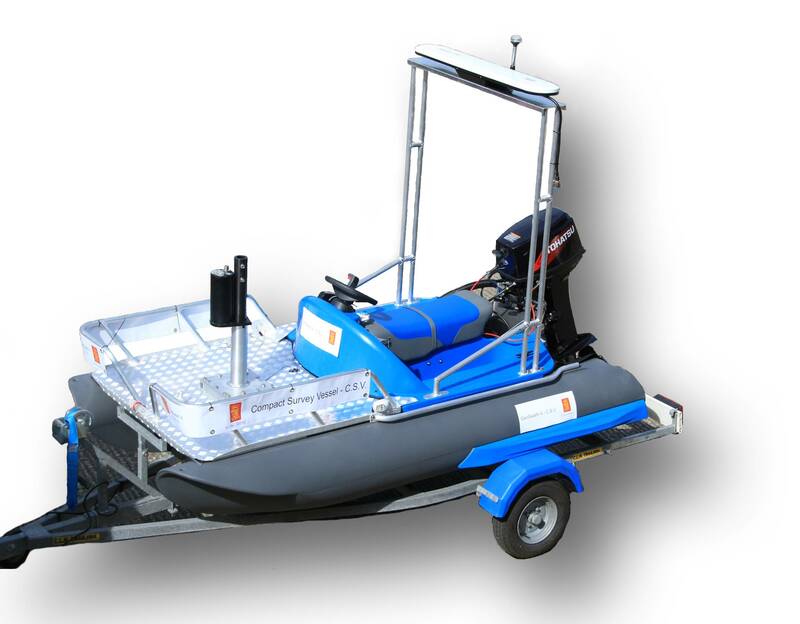 It measures 3m in length, has a width of 1.62m and weights 182kg which includes the supplied 30HP outboard engine. Standard fuel capacity is 24L which gives the Compact Survey Vessel the ability to operate for many hours before the need to refuel. With a top speed of 27 knots it can quickly get from launch site to survey area. The vessel has a draft of just 0.35m so can operate in extreme shallow environments and by utilizing the GeoSwath 4R system it can quickly map bathymetry and record geo referenced side scan data. The GeoSwath transducer is mounted on a retractable pole with pre-installed motion sensor, GPS heading and position system and sound velocity sensor. The operator uses a console mounted ruggedized laptop to plan and control the survey. The GeoSwath 4R system is pre-calibrated so that the survey operation can commence immediately on arrival, and no time is wasted running additional survey lines. Its shallow draft, high top speed and maneuverability combined with the stability of a catamaran hull make it ideal for use in both marine surveys and on canals, river and lakes. The ability to steer tight survey grids makes it a fast and accurate addition to the surveyor’s portfolio. The new GeoSwath 4R system offers unsurpassed productivity in shallow waters with at least 12x water depth coverage right up to the waterline complying with the performance standards defined by the International Hydrographic Organization’s performance standards for bathymetric data. The new Dual Ping system provides double the data density along track resolution compared to previous GeoSwath Plus system. As well as significant hardware changes, there has also been a major update to the associated processing and visualization software with the included GS4 package. The GS4 software package offers a number of new features including a feature filter for automatic filtering of vertical structures as well as a new user friendly graphical user interface with an initiative design. The software offers real-time processing and a series of automated filters which deal with complex survey situations. The system requires no third party software packages to operate although interfaces are available to all major packages. The software additionally works with the re-designed GeoSwath 4 deck unit which is a smaller modern design nearly half the weight and height of its predecessor.